Click Here to set up your NetX-Web™ Demo Today! Adding NetX-Web™ Internet-based management service greatly enhances the power of your new or existing NetX™ XBus or StrongMesh system. It takes our already highly efficient system to the next level with even more control, management, reporting and savings. In addition to our famous point-and-click scheduling and real-time control, NetX-Web™ provides a host of charts and graphs for dynamically viewing historical events and data. These features allow for the complete analysis of ever-changing HVAC environments, giving you the power to fine tune schedules and setpoints for even greater energy savings while maintaining comfort. 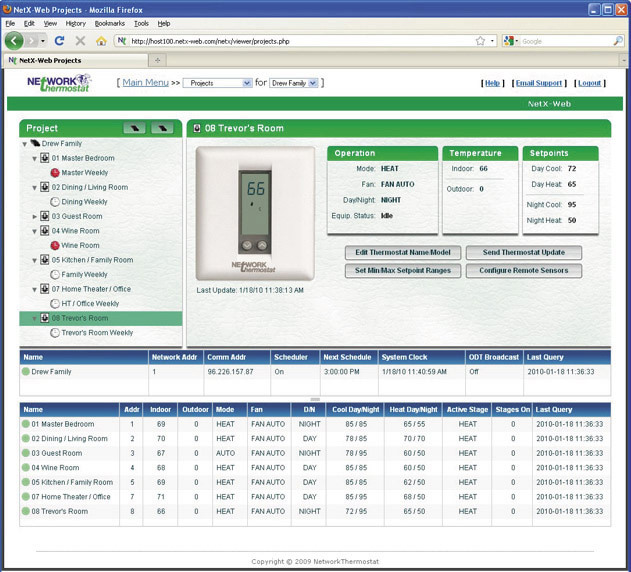 Plus, NetX-Web™ has all of NetworkThermostat’s familiar point-and-click, drag-and-drop ease of use that has simplified HVAC control for over a decade. 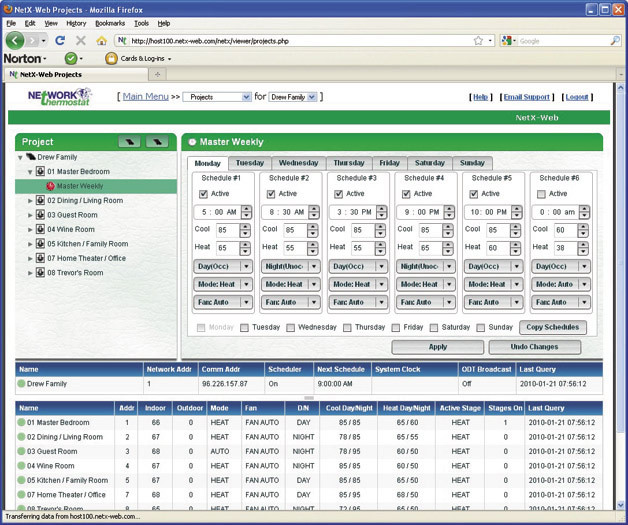 NetX-Web™ is a browser based environment for the Net/X™ XBus and StrongMesh thermostat systems, allowing full thermostat real-time control, scheduling and monitoring, accessed in a multi-user environment, from any computer operating system: PC, Mac or even Linux. 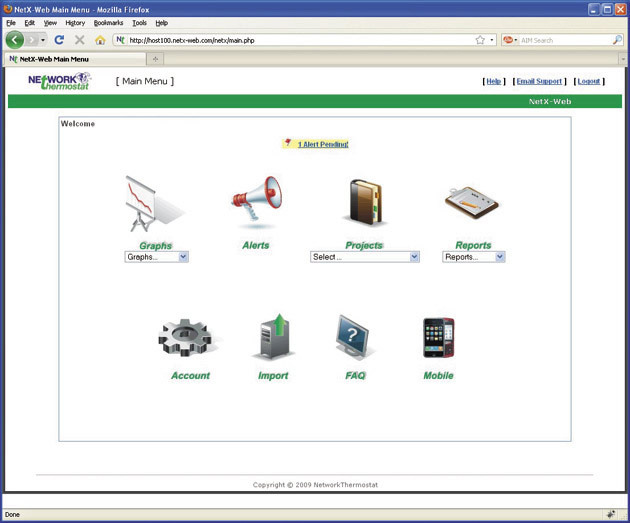 NetX™-Web supports all of the major browsers including Internet Explorer, Safari and Mozilla Firefox. For all of NetworkThermostat’s customers since 1995, migrating to Net/X-Web™ is as simple as using the one-button Import function, allowing each project to be pulled into the new service automatically. Any Apple Mac® using OSX with Ethernet and/or Wi-Fi, and the most recent JAVA application installed. Along with Project Management, the ALERTS Package gives both email and text message alerting to a wide range of conditions including inefficient equipment run times, low inside and outside temperatures, high inside and outside temperatures, missing controllers and missing thermostats. 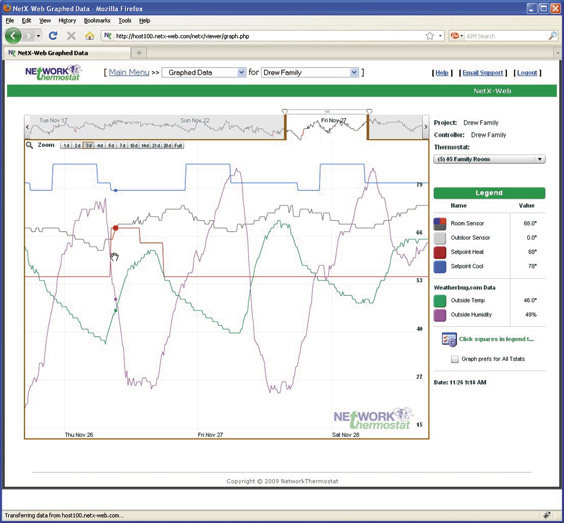 Along with Project Management,the GRAPHING Package gives Dynamic Graphing of any Net/X thermostat in addition to detailed data and monthly usage reports for each piece of equipment in your system(s). When complete power and flexibility is needed, the COMBO Package is the answer. This package includes all of the options of both the ALERTS and the GRAPHING package at a discount. This is your entrance to the NetX Web™ management system. It helps you easily navigate through Projects, Graphs, Alerts, Reports, Account, PC Project Import, FAQ and Mobile application sections. From the dashboard you can move from one section to another on the fly, including all management functions such as importing project(s) from the Net/X™ Command Center software format, modifying users, access projects and run reports. The Project Management section allows efficient control of as many thermostats as needed. Whether your task is to manage just single residence or an entire chain of retail stores, manufacturing facilities around the globe, NetX-Web™ allows point and click control, flexible project grouping and 24/7 password protected access. NetX-Web™ is no ordinary 'software in the cloud' solution. While in the Project Management tool, drag-n-drop rearrangement, copy and paste functions, and even 'right-click' features spring into action, just as if you were using our PC application. Only Net/X-Web has it. Accessed through the Projects button, set up every thermostat with its own specific program. 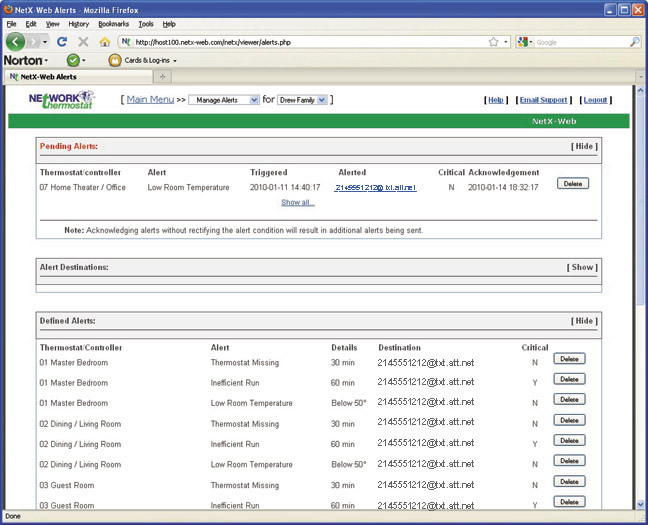 Make thermostat scheduling as simple or as sophisticated as needed. Creating from one (1) to six (6) schedules per day gives you the flexibility you need. And with NetX-Web's drag-n-drop capabilities, you can create a single schedule and more or copy it to any other thermostat, anywhere within your project. Even if the thermostat is on the other side of the planet! Now that's power!. Define what’s important to your project(s) and let the system send notifications of an HVAC malfunction or unscheduled environment change via e-mail and/or text message to one or multiple users. Different users can receive different alerts based on their need and function. Critical HVAC alerts can be sent to an HVAC service company via SMS text message while other non-critical alerts can arranged to only be sent to others via email, as desired. Investigate the performance history of any thermostat, at any time period you prefer; simply grab the slider and adjust it to see just the time frame and data you need. Dynamically change options to view any combination of setpoints, room temperature and outdoor sensors, as well as WeatherBug driven temperature and humidity data from the location of the thermostat.